Pumpkin Brluee Pie. Ive got a link incorporated, so you can get a visual (which is actually very similar to what would have been our visual had I had the camera and just a little less chardonnay). The recipe that the link links to is bruleed pumpkin bourbon maple pie, which is slightly different from what I made, but I’ve noted what I did below. In any case, it’s really all very easy, and such fun – candlelight, good company (audience) and a Bernz-o-matic blow torch – what more can you ask from Thanksgiving dinner? 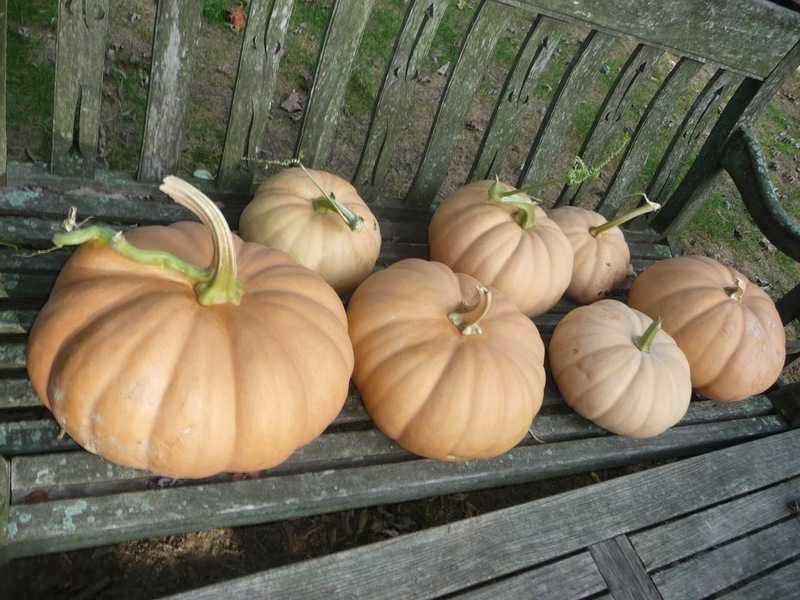 The pie (as I do it) starts with an heirloom French cheese pumpkin (Curcurbita moschata). Cut one in half, which, depending on size, usually requires a hefty knife and some elbow grease (be careful, you have to be patient and keep working it side to side to get all the way through without slipping and cutting off vital bits of yourself). Scoop out the seeds, which you can save and replant next year or put in the compost for a shot at next year’s serendipitous growth. Turn the halves cut-side down to on a high-sided baking sheet (there will be a fair amount of moisture sloshing around when it’s finished cooking and you don’t want it sloshing all over the bottom of the oven). Roast at 350F for anywhere from 50 minutes to an hour and a half, depending on size. It should be soft to the touch. Cool enough to handle and scoop out all of the flesh into a sieve over a bowl to let it drain. (Have a cup of tea or read a magazine for about 15 minutes while it’s doing this). 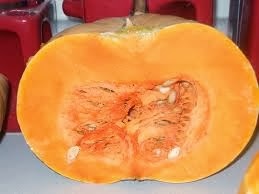 Once the roasted pulp has drained, put it into a food processor or blender and process until smooth. Or you can use elbow grease again and do it by hand with a masher followed by a whip as though you were whipping cream to get the pulp really smooth. Then use the pulp as you would canned pumpkin. This sounds like a lot of work, but it’s not nearly so labor intensive as all these words make it sound and the result is MUCH more flavorful than canned. Working time is about 15 minutes total.). You can easily use the recipe in the link. I only use it as a guide and make alterations. For example, I don’t do chocolate crust, which sounds revolting to me (but maybe that’s just me), and instead pre-bake a regular pie crust so it will be completely crispy and done all the way through instead of doughy-and-disgustingly uncooked on the bottom, which is what usually happens when you throw pumpkin filling into an uncooked shell. For the filling: Mix 1 ½ cups of the roasted pureed pumpkin with 3 eggs, ¾ cup brown sugar, 1 tsp cinnamon, ½ tsp powdered ginger and about ¼ tsp nutmeg, ¼ cup bourbon, and about ¼ cup whipping cream. I throw it all into the food processor, which makes it easy and you don’t even have to clean the machine between pureeing the pumpkin and mixing the filling. Pour the filling into the pie shell and bake at 325 for nearly an hour or until a knife inserted in the center comes out clean (as you do with custard). Spread about 1/3-1/2 cup demerara sugar evenly overtop the slightly cooled pie (give it about 30-45 minutes out of the oven). Then take the pie and the Bernz-o-matic, which you entrust to a reliable (sober) person to the table. In my case, our sober reliable person was our grown son who promised not to brulee anything besides the pie (and didn’t). Light the Bernz-o-matice, adjust to medium low, and pass the flame over the sugar. Don’t let it linger too long on one spot and continue until the entire top is a melted and has turned into a crusted golden-bronze glaze of sugar. Dramatic and delicious. Cut with a sharp knife and serve with whipped cream. Ooohs and aaahs ensue. And it all started with a lowly gift from the compost. I made this pie for Thanksgiving too, Nancy! I also omitted the chocolate crust. I love chocolate, but not in my pumpkin pie! I also made sure to use fresh young ginger, which makes it definitely delectable. Thanks for sharing!